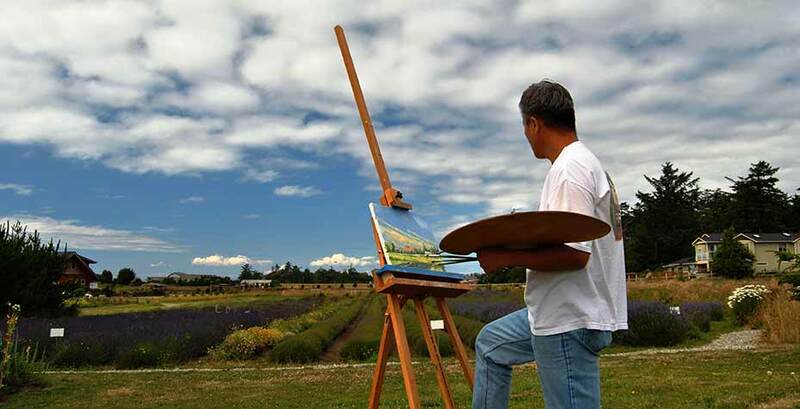 It still catches some by surprise that people come from all over to teach and learn art on Whidbey and Camano Islands. But, if they met world-class traveler, teacher, and photographer, Jack Graham, they might get a better understanding of how this happens. Graham travels more than 200 days a year taking photographs and teaching photography. Often, you’ll find him as far away as Iceland or Norway, teaching small cadres of students how to be more thoughtful about the images they take and become consistently better photographers. However, since he lives in the Seattle area, he has anywhere from four to six classes at Coupeville’s Pacific Northwest Arts School, which for 30 years has played host to art students and teachers from all over the world. The school, hidden away on a Coupeville side street, plays host to 80 to100 workshops and 500 students each year. About 400 of them come from off the island and spend part of the time enjoying the area’s natural beauty. Many stay in nearby bed-and-breakfasts and walk to class. Lisa Bernhardt, the school’s executive director, says it all began when several Whidbey Islanders recognized that there should be some higher-caliber art training on the island. Besides photography, the school offers classes in painting, fiber arts, mixed-media, and more. Current workshops can be found at the school’s website. A combination of quality teachers and a beautiful island escape has made the school more popular than ever. The school currently enjoys three consecutive years of double-digit growth. Graham doesn’t critique student photos, explaining, “Critique is kind of a negative word.” He prefers to just talk about photos and sometimes have the student go out and re-shoot the image, re-imagining it as a better photograph. The days in Graham’s class can be long, starting before sunrise and ending after sunset, when light is perfect for some wonderful images. While the classes are serious and Graham hopes for good work from his students, one of the things he stresses is slowing down and relaxing. Searching for new experiences, creating some art, and spending time in a beautiful place. That’s just another way to describe a Whidbey and Camano Islands experience.